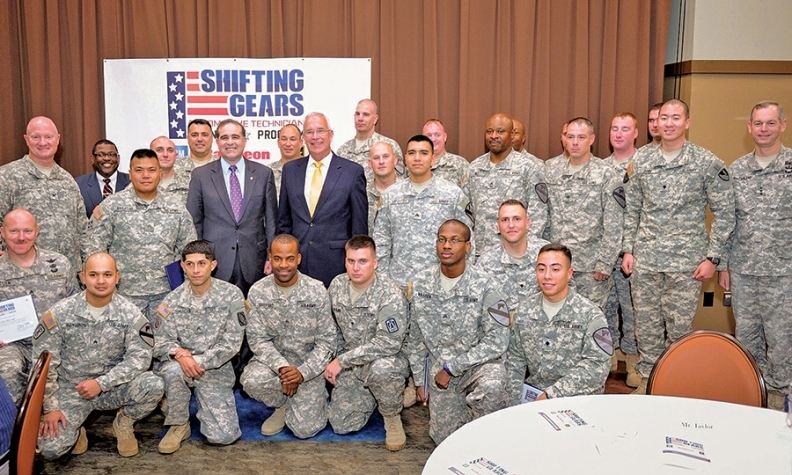 The first Shifting Gears class celebrates graduation last year. Soldiers begin training before they are discharged. Mission: Train military personnel to become automotive technicians. General Motors is working with the U.S. Army to train discharged soldiers to serve as service technicians at dealer-ships. Based at the Fort Hood base in Killeen, Texas, the program has trained 116 people since it began in the fall of 2014. About one-third of them have gone on to work in the service departments of GM dealerships, says Mark Miller, GM's director for dealer service and global warranty operations. Miller said GM's involvement is twofold: to support military personnel and, long term, to help ease an industrywide shortage of qualified service techs. "This is an effort to take someone who understands a mission, who is all about accountability and integrity, who shows up for work to do a great job," Miller told Automotive News. "Who wouldn't want to employ a veteran?" Students receive 480 hours of training over 12 weeks, learning everything from transmission servicing and electrical diagnosis to engine teardowns. The program includes classroom, online and shop training. The soldiers typically begin their training within 90 days before being discharged. When finished, they're qualified to handle light repairs and ready to begin GM's in-dealership tech training program, if they get hired. Miller said GM is aware of 35 of the 116 graduate soldiers who are employed at GM dealerships. Some find jobs at other shops while others might choose not to become a full-time mechanic, he said. "A lot of them get a position in the field that may not be directly at a GM dealership, but we're happy to help fill the mission of the Army to find that solider a good-paying job," Miller said. The program, Shifting Gears, is a multiyear partnership among the Army, GM and defense contractor Raytheon Co., which for years has partnered with GM on its technician-training programs across the country, Miller said. Mark Chockran, general manager at All American Chevrolet of Killeen, said his store has hired three graduates to work as technicians. "Their understanding of the technology and GM service systems puts them ahead of other candidates," Chockran said in a statement. Miller described the program as "still in its infancy" and said there is the potential to expand the training to other locations if the Fort Hood effort proves successful. Miller hopes the program eventually will serve as a pipeline to fill some 2,500 technician vacancies that pop up each year across GM's roughly 4,300 dealerships because of retirements and turnover.